Quick, switch to another browser like Mozilla Firefox now! Users of Microsoft's Internet Explorer 7 – far and away the world's most common internet browser – are being advised to use another browser due to a serious security flaw. The IE7 flaw is reportedly making it very easy for criminals to obtain personal data and passwords. "Microsoft is continuing its investigation of public reports of attacks against a new vulnerability in Internet Explorer," the company announced in a security advisory alert about the flaw. Microsoft is hurriedly putting together an emergency software patch to resolve the issue, but in the meantime if you are concerned about your privacy, we can only suggest that you seek an alternative browser. 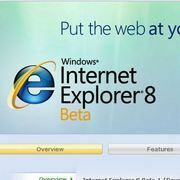 Microsoft also added that the flaw was in IE7, though previous versions of Internet Explorer were also potentially vulnerable. More on this as we get it.